Automatic hand gun first developed in 1908, manufactured by Deutsche Waffen-und Munitionsfabriken (DWM). Marked with the DWM monogram, and 'g' for Gewehr under the serial Number indicates it was made for a Rifle Company, it is also stamped with the Kiasers Mark. The Parabellum-Pistole (Pistol Parabellum), popularly (but incorrectly)known as the Luger, is a toggle locked, recoil operated, semi-automatic pistol. The design was patented by George Luger in 1898 and produced by German arms manufacturer Deutsche Waffen-und Munitionsfabriken (DWM) starting in 1900; it was an evolution of the 1898 Hugo Borchardt designed C-93. The Luger was made popular by its use by Germany during World War I and World War II. Though the Luger pistol was first introduced in 7.65x22mm Parabellum, it is notable for being the pistol for which the 9x19mm Parabellum cartridge was developed. In World War I, as sub-machine guns were found to be effective in trench warfare, experiments with converting various types of pistols to machine pistols (Reihenfeuerpistolen, literally "row-fire pistols" or "consecutive fire pistols") were conducted. 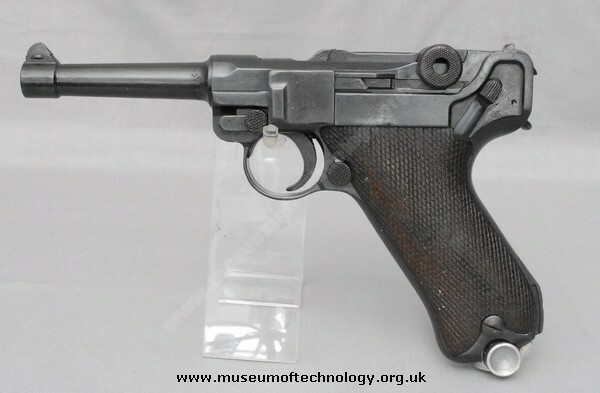 Among those the Luger pistol (German Army designation Pistole 08) was examined; however, unlike the Mauser C96, which was converted in great numbers to Reihenfeuerpistole, the Luger proved to have an excessive rate of fire in full-automatic mode. The Luger pistol was manufactured to exacting standards and has a long service life. Bill Ruger praised the Luger's 55 degree grip angle and duplicated it in his .22 LR pistol. The "g" under the serial number is nothing to do with either "gewehr" or Rifle Companies, it is part of the serial number. P.08 pistols were numbered from 1 to 9999 then 1a to 9999a, then 1b to 9999b etc., so your serial number represents a gun in the 70,000 series (g being the seventh letter). Also, the Parabellum pistol was in production from 1900 and it was the 9mm version that was made from 1908.